I'm so happy I saw your post. I have been a middle school science teacher for 22 years and am currently in my second year as the K-5 grade science teacher. We also have a pre-K class here, so this Spring I'm going to meet with them and want to use Forces as my lessons with them. You have helped me focus the direction I want to take this class. Thank you. Dear Kathy, What a great question. I checked the Pedagogical Implications (PI) section of the Force and Motion SciPack for ideas on how to respond, I wounder what others here think? The PI state that students at this stage (K-2) are not ready to fully understand the relationship between forces and motion. But they should be making careful observations and descriptions of both the motion of objects and the effect of pushes and pulls – so you are right on track. Some ideas for observations may include: (1) Things move in different ways (forward, backward, left, right, zigzag, fast and slow, etc. ); (2) You can change the way something is moving by giving it a push or a pull; (3) Things fall to the ground unless something holds them up; (4) Magnets can be used to move things without touching them. What do others think? Have you done Force and Motion activities that you can share with 4-5 year olds? Flavio. Another good book for starting discussion about motion is Wheel Away by Dayle Ann Dodds. Afterwards you can take the children outside and have them roll hoops. Betty Zan and Rosemary Geiken are very persuasive in the January 2010 Young Children article, Ramps and Pathways: Developmentally Appropriate, Intellectually Rigorous, and Fun Physical Science, also described in other works. The children I work with are still beginners but are interested in this activity every week. Thanks Peggy for this article! The timing is perfect. I have just purchased 4 books for exploring Push, Pull, Movement that I will use in the next few days to begin writing my plan for working with the four year olds when the SEPA board meets at the end of the month at the University of Western Alabama. As I begin this process I know I will have questions that I will post on this thread. I will also share my lesson plan as a draft here hopefully by the end of next week. At that time I would love some input. I was thinking about starting with "Head , Shoulders. Knees and Toes" followed by a quick discussion about how we moved. Thoughts??? Children like to do the Head-Shoulders-Knees-and-Toes, going at different speeds to be silly. A question off the top of my head is: will the discussion be about the external movement of their bodies or what happens inside to make the external movement? The children might have trouble getting the internal push or pull by muscles but I don't have any experience to base that on. Of course a few may have watched a program on TV about muscles and can tell all about it! Peggy, I was thinking about external movements of their bodies..hands to heads, toes etc.... I also think the internal piece would not be developmentall appropriate for this age level. Is there another song that might work better? I was hoping to include music as well as physical movement in the lesson. Thank you for your questions. Probing and clarifying questions help me to think through my ideas, not mention it is great having a dialogue such as this with a colleague. Kathy I'm always happy to share and learn. Here's another song that has motion, very silly, fun, and a good teaching tool--Tooty Ta by Dr. Jean. Posted on a teacher blog and available on her albums, er, CDs. Her NAEYC sessions are always full of early childhood educators having fun! See more action songs on the Songs for Teaching website. I teach at several preschools in northern Virginia as a science specialist. I love working with the children but I think children learn more when science is facilitated by the classroom teacher. By not being in the classroom full-time I miss many "teachable moments" and cannot sustain science inquiry at the level I know children are capable of. Ideally I would like to work as a science coach or mentor, if funding were available. All of the lesson 2 is an elaboration that includes the investigation in the Science & Children written by Peggy Ashbrook in "Roll With It[in the Early Years column. Thanks, Pam. The science song junkie in me loved listening to some of the lyrics and tunes on that site. I came across a website from Jefferson County Schools in Tennessee. It had some neat free games for all grades. It had one for kindergarten students that had to do with the force of gravity. I got stuck on the second mission of the Gravity game. I guess I had better go back to kindergarten to be successful. My grandson wouldn't have had any trouble with it! In addition to teaching about pushes and pulls, students can also be introduced to the idea of work and possibly power as well. While measuring force is more advanced, they could probably talk about which push/pull is more/less. My daughter used to like an old book I found about a kid stretching a rubber band from his bedpost down the street, on a train, a boat, a plane, rocket... to the moon and then gets sprung back into bed. I found an amazon link to the book http://www.amazon.com/How-Far-Will-Rubberband-Stretch/dp/0671693611 I teach AP physics. I think very young kids can understand force and motion. Probably not worry so much about specifics. You might do better to concentrate on inertia. That things tend to do what they are already doing. If they are still they will stay still unless something changes them if they are moving they will keep moving in a straight line unless something changes them. Really if you are talking about Force, you will wind up discussing acceleration which is too much. Let me think some more on this. Here I am. I said I would tell you about the actual experience in Alabama. Well the first piece of information it is necessary for you to know is that I worked wth 3 year olds and a couple of 2.5 year olds. I started with the word Movement/Moving. When I asked the students about moving they told me they only move so they can watch TV. I will be very honest and let you know that for a second or two or three, I wasn't sure where to go. Then I realized that the students did not recognize the vocabulary, they had no experience with the words I was speaking..so I knew I had to provide experience or find some connection to their prior knowledge. I decided to move on to the Hokey Pokey. That was a good move. We sang and danced and the students were able to make connections between moving their arms, feet, nose etc and the concept of moving. Okay, this is what I did. Before I share more of what actually happened, I am wondering what your thoughts are about this concept development?? Please share . After we did the Hokey Pokey, I handed out cars, balls, and different objects that would slide. Well, the sliders were not a big hit. The balls and cars worked beautifully. They rolled and bounced happily for a bit, probably about 10 minutes. I then collected the materials and I asked them if they had any words to describe how the cars and /or balls moved. The children were able to come up with ROLL and BOUNCE. We then said "roll" a number of times. If space had allowed, I would have asked them to show me roll with their bodies. The last part of the lesson was when the students had a piece of drawing paper where they drew something about movement.I then wrote on papers short phrases or sentences they told me about how the ball or the car moved. I remember feeling very flustered wondering if I had actually achieved my goals for the lesson. After much reflection, I think the answer is yes. I think the students moved forward in their understanding of motion. What a great discussion we have going here! Kathy, thank you so much for sharing your reflections on your lesson. I've actually added a block to the bottom of my lesson plans where I can do a post-lesson reflection of what worked, what didn't, what I'll change the next time I teach the lesson, etc. It's so much easy to do when the lesson is still fresh in my mind instead of trying to remember a year later! I really appreciated your ability to improvise during your lesson. It's not always easy to have a plan B, but you never know when things will unfold 180 degrees from what you planned! One technique I've used to help combat gaps in vocabulary is the ABC-CBV method. It stands for Activity Before Concept - Concept Before Vocabulary. This technique helps give young students a reference in context that helps them understand the vocabulary. I've also found that very young students sometimes have trouble writing, but they have endless creativity and and make excellent drawings. I have a kidney bean table at the front of the room and as students finish their drawings they come up to the table for a "Scientists' Meeting" with me (upto 5 students can sit at the table. If the table is full, students take a number from a basket on my desk and come up in the order of their numbers when the next seat opens up). They dictate what they drew and I help them write the sentence. I also liked Dan's idea to begin teaching young children about inertia. The more you introduce young students to scientific concepts, and let them have fun exploring these concepts through inquiry, the more likely they will be to pursue science in high school, college, and as a career. NSTA Press has a fantastic book called Start Young: Early Childhood Science Activities that is an excellent resource for anyone who is teaching young students. Here is an article that I think you would find helpful when teaching young children about force and motion. The explaination of the terminology used is excellent and the article is brief but to the point. Thank you for this link Sheep in A Jeep. I will share this with some teachers I know who use this book as part of their reading program. I also want to share that Sheep in a Jeep can be used in grades 3-5 for science and literacy. There is a chapter in Picture Perfect Science published by NSTA press. Hi Kathy, Here is a one-stop, free resource for teaching forces in motion at the kindergarten level: http://www.ngsp.com/Portals/0/Downloads/57237_WOL_LLV_Early_FAM_lr.pdf You will find songs, vocabulary activities, books, assessments,collaborative activities, using think alouds, modeling asking questions and resources for ELLs.There's a push or pull ws that has pictures of common objects and asks the students to label them push or pull...like a wagon and a zipper etc. I love teaching kindergarten because the children are so eager to learn everything! There is a fabulous book (recommended by NSTA) that is called Marvelous Moving Things early childhood science in motion. It is published by Terrific Science Press. I am putting together a Professional Development for some of my teachers and I am using this book to help with the workshop. Mary, Thank you for the reference. I checked it out and will most likely purchase it. 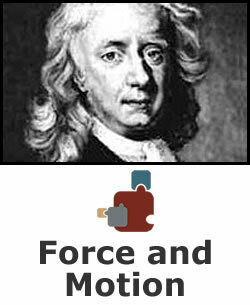 I would like to put together a a force & motion course for either preservice or inservice teachers. To make it even more challenging, I want to figure out then how to teach that course online. Anyway, back to the subject we were discussing, this book looks great!! I'm certain you have already done your workshop, but I have to tell you about this resource. Terrificscience.org has a series of three books for the early childhood level called Marvelous Moving Things, Colorful Crayons and Squishy, Squahsy Sponges. The series is called Big Science for Little Hands. They used to always be at the conferences, but Mickey Sarquis, the director of the larger program has retired. I heard that there may be changes to the program now. Anyway, Marvelous Moving Thingsdescribes activities like putting marbles in paint and then in a box and describing the motion, then trying to predict where the marble will go if you move the box certain ways. MMT and SSS are my favorites in the series. I also did a session at NSTA in which I used cookie sheets to make ice ramps because children in the south have fewer informal experiences with ice and other low friction surfaces so they have more problems with Newton's Laws of Motion. With ice ramps they can see that wheels don't turn, toys just slide down, etc. They can even try closing the door to a toy car and see that the car moves more on the ice. If you have an ice rink nearby, the unit could lead to a field trip there. Otherwise, if you're very careful, you can let students stand on the ice ramp and feel what it is like to try to take a step. The units in the book are interdisciplinary and include what students say as they do the activities. We used the books as introductions to science inquiry and interdisciplinary teaching at an early childhood conference that focused upon Headstart teachers. Were you (or was anyone else) able to attend this particular NSTA conference offering? If so, I would love to hear about it. Also, I just finished reading and reviewing an article geared toward early elementary children. It provided some great examples of how to engage young children in data collection by using tally charts. I can see the idea being used to collect data on force and motion topics, too. The article is from a Science & Children journal. Was this one of your articles, Peggy? It was a great read - filled with ideas! Hi Kathy and thread readers, I receive via email SmartBriefs on Ed Tech sponsored by the Harvard Graduate School of Education. Today there was an article about kindergarten students in a Maine school district getting iPad2s. I am wondering from those of you who work with young children, do YOU think that kindergarteners are too young for this expensive technology? The cost to the district was $200,000. Does the achievement they might experience merit the expense? Today there was an article about kindergarten students in a Maine school district getting iPad2s. I am wondering from those of you who work with young children, do YOU think that kindergarteners are too young for this expensive technology? The cost to the district was $200,000. Does the achievement they might experience merit the expense? Since the iPad uses touch technology, I think it would be very easy for Kindergartners to learn and manipulate an iPad. My major concern would be breaking the screen. Since the iPad's screen is glass, they are relatively fragile and will break easily if dropped, stepped on, etc. Otter Box does offer a fairly robust case to protect the iPads, but that would be an additional expense. It will be interesting to see what the functionality and productivity analysis would show for iPad versus a comparable priced laptop usage in a kindergarten classroom. I think the activities have outlined are spot-on! Each of the activities encourages the students to learn in a hands-on learning environment. Will you be using the 5E model in these lessons? maureen - I think you are right in that the important aspect of the ipad is the touch screen. Will it make it that much easier for little hands to manipulate items in a virtual lab I'm not sure. Bit it will make learning more personal. Think about how a 5 year old related to electronic media so much more naturally than we ever will. Being :stuck in front of a computer screen" even a laptop screen, is going to be as unpleasant as older students now feel about static print based texts or even worse - encyclopedias! If you can manage to keep them from being stepped on - I wonder if we will become more clever as teachers - watching a group of young engineers collaborate using an ipad to perform virtual experiments and then doing the same experiment live - possibly documenting it by using the camer function to record what is happening? Caryn Love the iPad I use now daily. There does seem to be something unique about the form factor, instant on, long battery life, and larger touch screen for input/manipulation. With geolocation aware features and apps that now may support wireless probes, and built in 3-G (4G eventually) connectivity, seems to be perfectly poised to support "in-field" collection and sharing of data, where you could push local relevant info or questions to students, and even eventually FaceTime collaboration as say local/national data is plotted in real time for analysis. School yards and parks become living labs! Other tablets will facilitate this as well! Future of technology convergence in tablets is bright--depending on how software and productivity apps used to support learning. A great extension for your lesson will be to show students how increasing force will increase the effect on the other object. For example, after the story Sheep in a Jeep and your activity, have them flick their fingers against crumpled pieces of paper. Instruct them to do it softly and tell them to note how little the crumpled piece of paper moved. Next, instruct them to flick it harder and let them see just how much further the crumpled piece of paper traveled. This is such a cute idea for a lesson. I like the idea of using a book and having the students do something active every time they hear about a push or a pull. It is a great way to keep them listening and engaged. I am a strong believer that students, especially young students, need to be active in their learning. Otherwise, they loose interest and get distracted. To begin this lesson, maybe you could have a student open and close a door. Then ask the other students how that one student was able to open and close the door. This would be a good way to activate their prior knowledge and get them excited about the story they are going to read. i really like your suggestion. Opening and closing the door is a perfect anchoring phenomenon for this concept . Students might brainstorm all the questions they can think of about the door opening and closing. As the teacher you would record the questions. The next step would be determining which questions were science questions. Once you have highlighted the science questions, you could figure out which of the questions could be investigated as part of the instruction. Then you, the teacher would use student questions as well as your questions to drive instruction. By doing this, student voice would be included in the instruction making it even more relevant and exciting for kindergarten children. I think this is such a cute and fun lesson for the students to do. This is especially great for those kinesthetic and visual learners. Incorporating a book is also awesome because the kids can view the lesson as a story, and become motivated to interact through the activities. Kindergarten is very hands-on; they learn and obtain much more information by doing the work. This idea is great because it uses all of those aspects and puts into one fun activity/lesson.